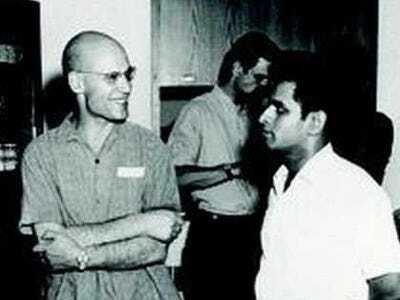 Konrad Jacobs, via Wikimedia CommonsAlexander Grothendieck, on left. Alexander Grothendieck, one of the most important mathematicians of the twentieth century, died at 86 on Thursday, Nov. 13, 2014. Grothendieck’s main mathematical contributions were to the field of algebraic geometry. Algebraic geometry is the study of the curves (and higher-dimensional analogues) formed by the solutions of algebraic equations, linking together the algebraic concepts of equations and numbers with the geometric ideas of shapes and curves. In the 1960s, Grothendieck and his contemporaries revolutionised algebraic geometry by establishing a powerful and abstract foundation for the subject. The techniques and generalizations originally developed by Grothendieck became the main set of tools used by mathematicians working in algebraic geometry for the last fifty years. Grothendieck’s reinvention of the foundations of algebraic geometry led to countless discoveries in the field in the last half century. His techniques were a necessary tool in the work done by Maryam Mirzakhani that earned her the historic first Fields Medal awarded to a woman earlier this summer. In 1970, at the age of 42, Grothendieck started to turn away from mathematics and later from society in general. As mathematician Winfried Scharlau wrote in a brief biographical note on Grothendieck, “he turned to the problems of environmental protection and ecology, he supported the antinuclear power movement, and he fought against military buildup, especially of nuclear weapons, and the military-industrial complex”. Through the 1970s and 1980s, Grothendieck became ever more reclusive. While he no longer worked in a conventional mathematical setting, Grothendieck would write incredibly long “meditations” that would be shared with only at most a handful of his peers. The subjects of these meditations varied from further developments in algebraic geometry to long, winding mystical speculations. Grothendieck was a truly brilliant mathematician, and in the twenty years he was active in the field, he reinvented the way we understand equations and curves.